Dieter Zetsche, the former CEO of the former merger-of-unequals called DaimlerChrysler and now the CEO of the unmerger-of-unequals called Daimler, stopped by his former underlings at Chrysler Monday during the Detroit Auto Show. So what did the ex-CEO — and brand spokes-German "Dr. Z." 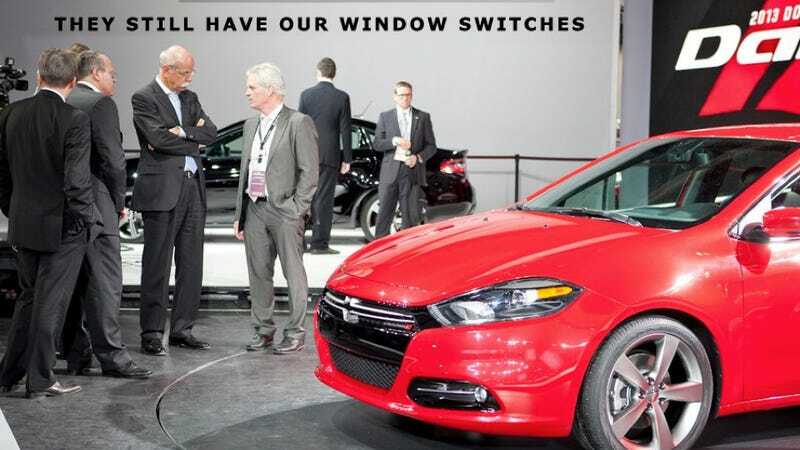 — have to say about the Italian-American car company's new econobox — the Dodge Dart — replacing the Dodge Caliber, the shitbox he once championed? Since I don't speak German, I've no idea. But a lack of multilingual talents didn't stop Ian Merritt, former Cars.com photographer, who has helpfully subtitled his shot with what he thinks Dr. Z's saying. Got any better captions? Leave 'em in the comments below.